Voluminous sleeves have been everywhere this year, and fall brings new options. A see-through blouse like this one can be your best friend when you’re layering. 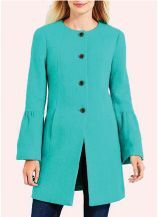 This teal coat is “as pretty as a party dress,” with its ruffied sleeves and universally flattering A-line shape. A silk lining amps up the luxe factor. Bell cuffs and ties at the elbows “make a simple solid-colored top feel fashion-forward.” For this jersey-knit rayonspandex tee, you tie the ribbons yourself. This top from Cos plays_the classic black blouse theme “anything but straight.” Made of soft scuba material, it drapes the elbows in folded_frill. 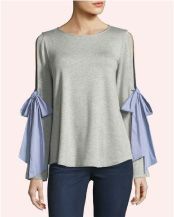 It’s “a pleasant surprise” to find an affordable sheer blouse with an attached camisole— and all the more so when it features ontrend bell sleeves.